A consignment agreement is a contract between two parties called the consignee and the consignor. It records the agreement for the storage, transfer or sale of a commodity. According to the terms of the consignment agreement, the consignee can take goods from the consignor’s stock. 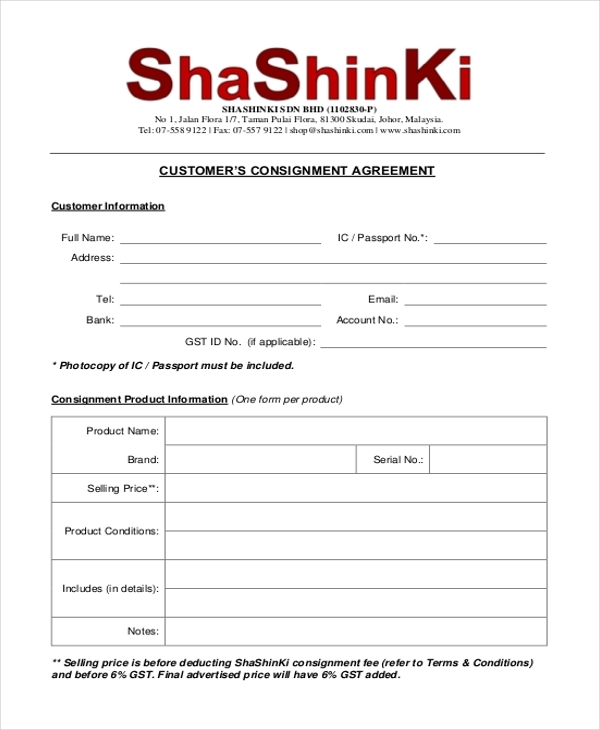 There are special forms to be filled for the consignment agreement between two parties. This Agreement Forms records all the terms and requirements of the contract and consists of the signs of both the parties as legal evidence. This form is divided into various sections. The first section details the requirements of the consignment agreement. It also enlists the terms and conditions required by the consignor. It must be drafted according to the rules of fair trading and regulations. You can also see Hold Harmless Agreement Forms. The consignment agreement for stock items is drafted upon various agreed upon conditions between both the parties. These include the subject of the agreement, establishment and management of the stock, payment procedures and the terms of termination. This agreement details the period of consignment and the distribution of payment among the parties. In a tabular statement, the form includes a list of all the items in the inventory stock. You may also see Deposit Agreement Forms. 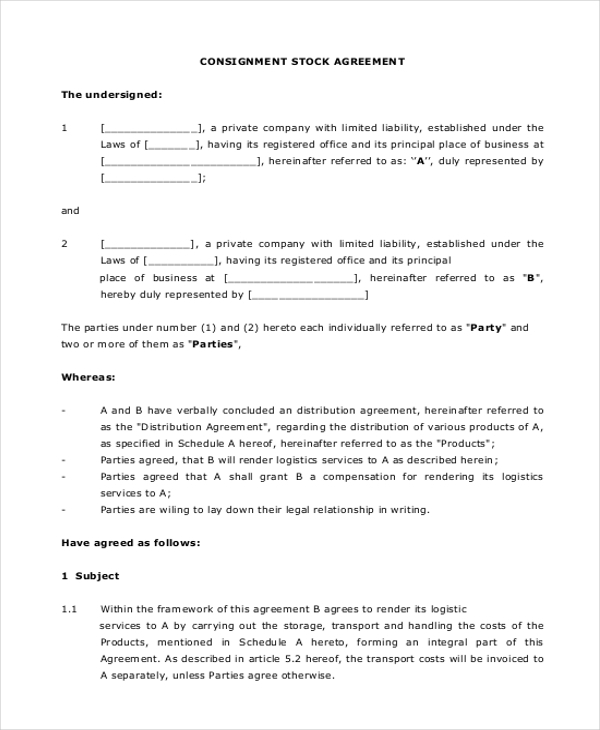 This agreement form is used as buy-sell agreement forms over a single or multiple vehicles. 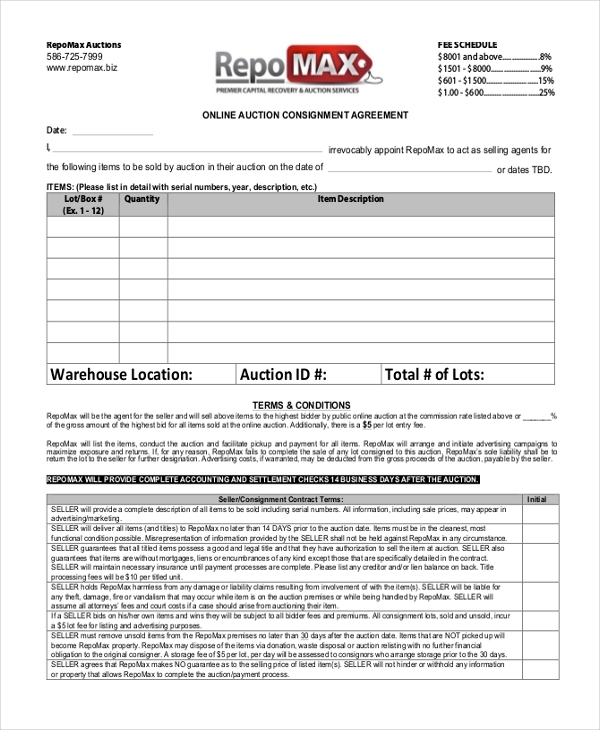 This form consists of the price of the shipment of the vehicle. The contract records a rate of payment to be paid other than the taxes and license. 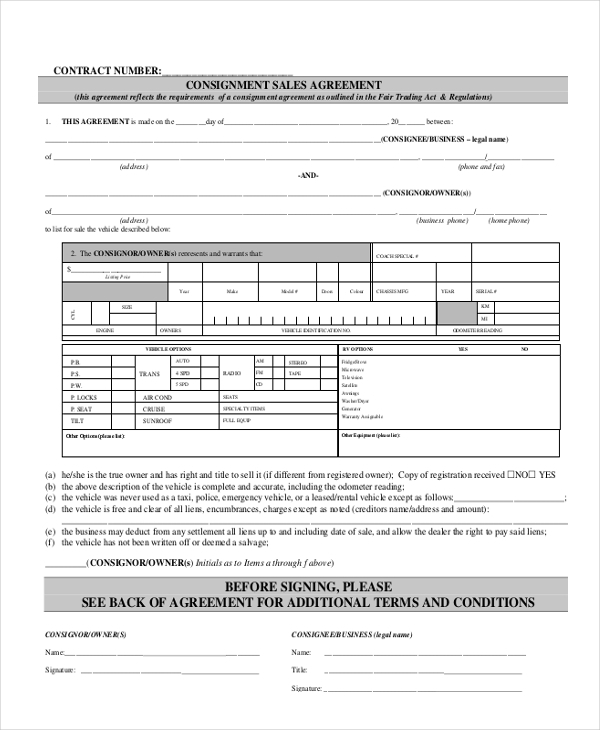 This agreement form consists of the details the customer like account no., passport no., email, etc. The information of the product including the name, brand, condition, selling price, etc. is also mentioned in a table. 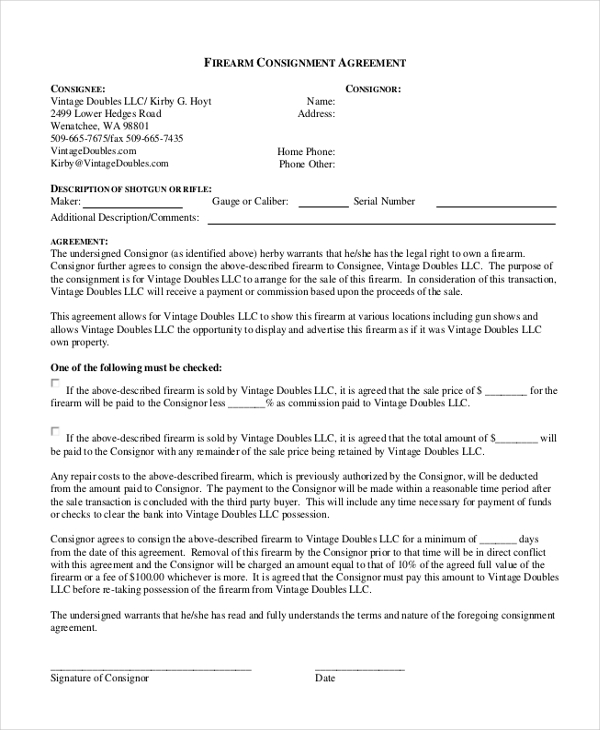 Through this form, the consigner affirms the legal rights of firearms to the consignee. It details the time period of consignment, the mode of payment and default price percentage. It is addressed to the consignee and signed by the consignor. 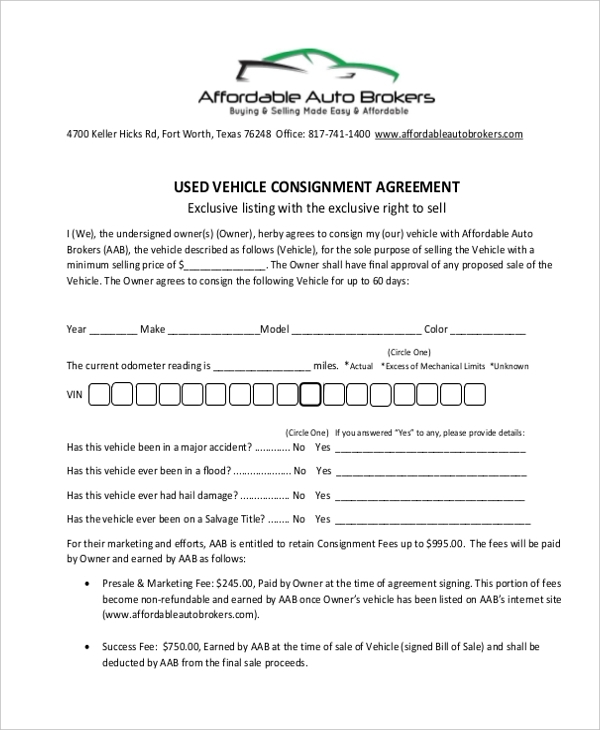 The complete details of the vehicle along with that of the consignor are written in this Buy-Sell Agreement Forms. It mentions the customer’s liability and the net worth of the vehicle consigned. The consignee mentions his sales commission. 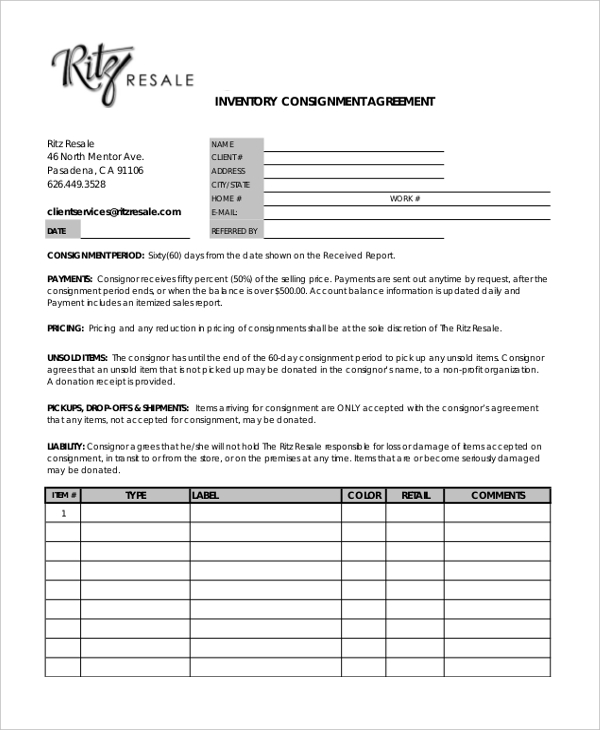 This consignment agreement appoints the consignor as the selling agent of the listed items. Products and goods are detailed with their quantity and other description. The contract terms are detailed along with the conditions of the agreement. The consignment agreement forms are usually used for the sale and resale of commodities such as vehicle or inventory. It is meant for the companies involved in the manufacture, distribution, and sale of goods. The consignee is appointed as an agent for selling these products on behalf of the consignor. Firearm consignment, for instance, relates to a company involved in the construction and trade of firearms. Consignment sales, stock, and inventory agreements are typically targeted for the businesses involved in consignment activities. 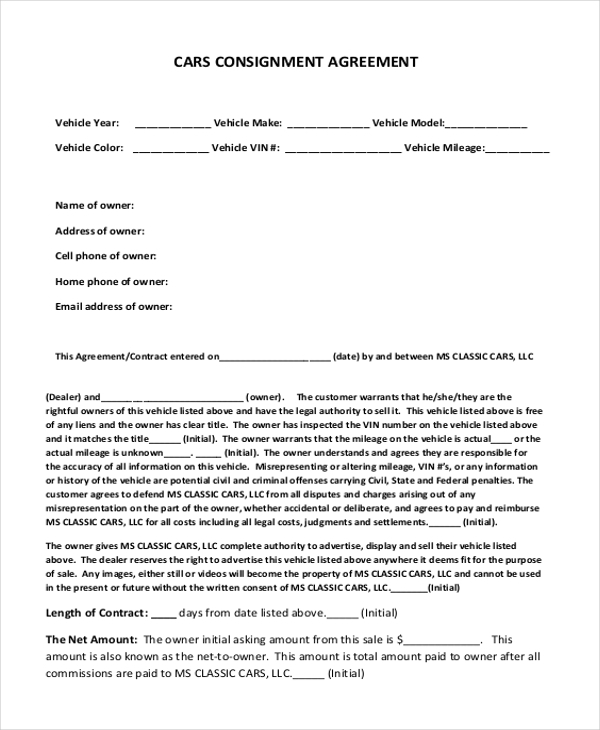 You may also see Service Level Agreement Forms. There are numerous benefits of a consignment agreement. It presents the companies a chance to sell or resell their manufactured products. It is easy for big companies to dispatch their outdated stock and inventory goods to be sold in the market. The consignee is given the chance to make profits from the sale of the consigned goods and earn well. Even a customer can be made the consignee by the company and therefore, get benefitted from the sale of the products and help the company at the same time. You can also see Operating Agreement Forms. The consignment agreements are contracts of transferring goods or property between two parties for sale or resale. The consignor is, in a way, able to get rid of the unsold stock and inventory products. At the same time, the consignee is able to make profits from the sale of goods. It is a lawful contract between the two parties to ensure a legal sale and transfer.